"This is a fantastic light salad, perfect for the dog days of summer. It's gorgeous and delicious! I had it at a wonderful restaurant in Napa, CA and went home to try to duplicate it myself. Have it for lunch or as a beginning to your summer dinner." Place 1 mango and the raspberry vinaigrette dressing in a blender, and blend until liquefied. In a bowl, toss the remaining mango, salad greens, cilantro, and onion. Drizzle with the dressing mixture. Top each serving with equal amounts of raspberries, blackberries, strawberries, blueberries, and hazelnuts. Sprinkle with Parmesan cheese. As backpack would say, YUM YUM YUM DELICIOSO! Subbed chopped pecans for the hazelnuts and used baby spinach. Perfect! Awesome! Oddly enough, I hate mangoes. I substituted mandarin oranges. This was a major hit at a party I attended this past week-end. 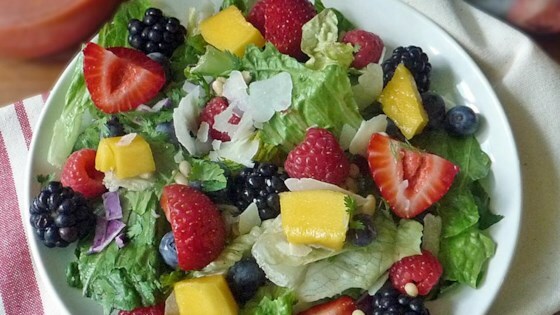 You can't go wrong with this wonderful berry salad. I have made this salad for BBQ's and parties, it is always a hit! I add some whole raspberries to the dressing in a clear jar so it looks as amazing as it tastes. By choice, I am mostly a saladterian. This is fantastic. Delicious. Perfect for summer. I made my own raspberry vinaigrette and added the mango to it in the food processor. Yummmm. I was fresh out of hazelnuts, so I used pine nuts I had on hand. Fresh and very tasty! I took this salad to a potluck recently and had so many requests for the recipe. I've saved it to my favorites and will definitely make it again.